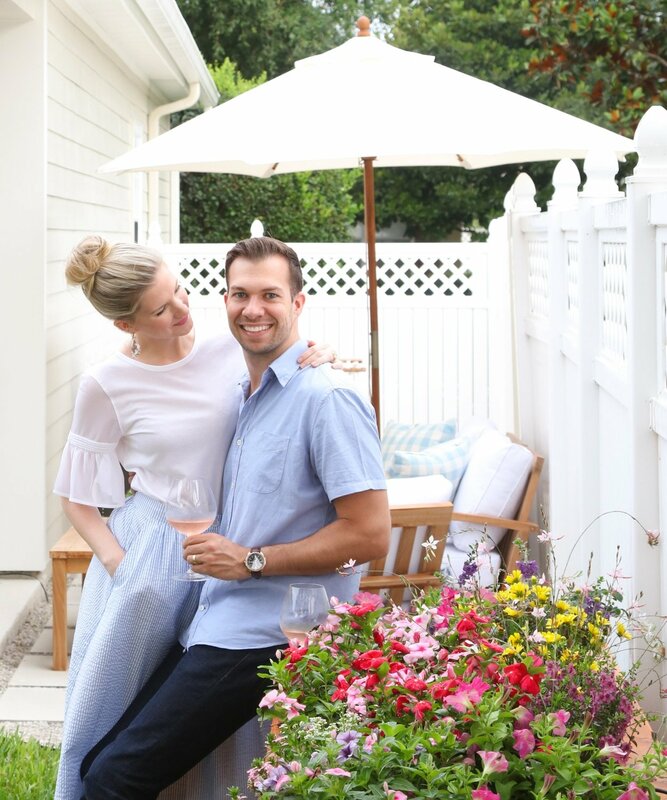 I’m so excited to share Part 2 in our Backyard series (see Part 1 here) with you today AND to have Ryan takeover for the day. Like I mentioned last week, our backyard was his project, and it would be cruel to not let him show it off. Plus, he did some seriously amazing DIYs that you need to try this summer! 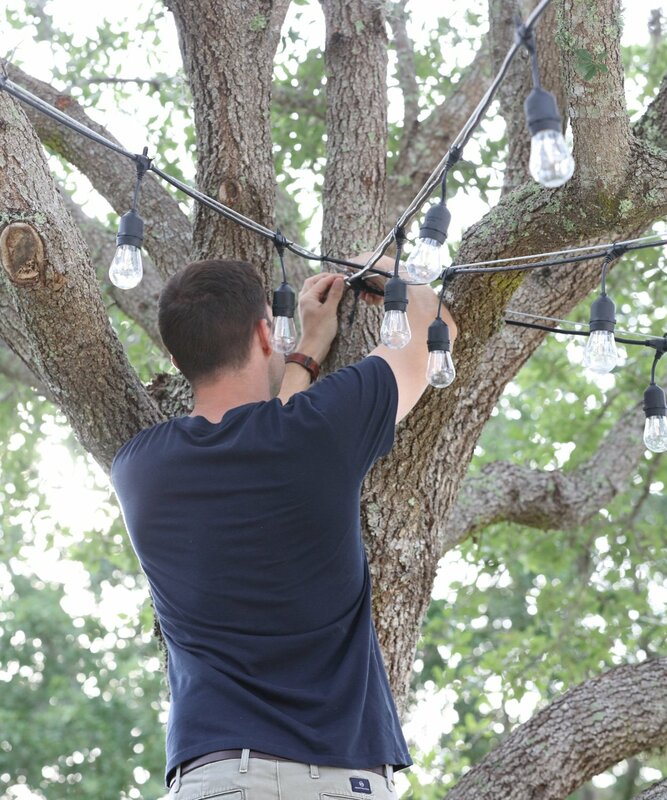 Today we are starting with the Canopy String Light DIY! 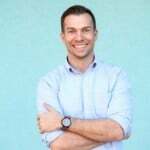 And have no fear… after reading this post you will know exactly what to do, because not only is Ryan handy, he’s also thorough! You can just go ahead and thank your lucky stars that I’m not the one writing this! Ha! So, let’s get started… Ryan, show us how it’s done! 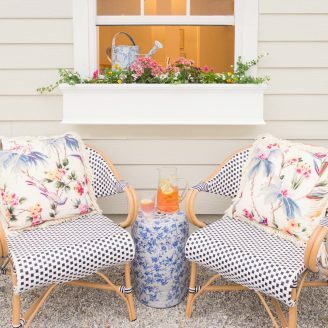 The real litmus test to know if a home project (DIY or otherwise) is worth the investment is whether you get the feeling that you don’t know how you ever did life without it. I’m sure there is a relationship or marriage metaphor in there somewhere, but that’s exactly how we felt about the lights. They make such a huge statement with our backyard ambiance. Early morning, dusk, evening, during rainstorms. We turn them on almost every chance we get! Putting up the lights came with a few unexpected challenges, but overall it was a fairly simple DIY that can be completed by anyone in just a few simple steps and definitely within a day. Here’s how to start. The first thing we did was take a good look at our backyard. 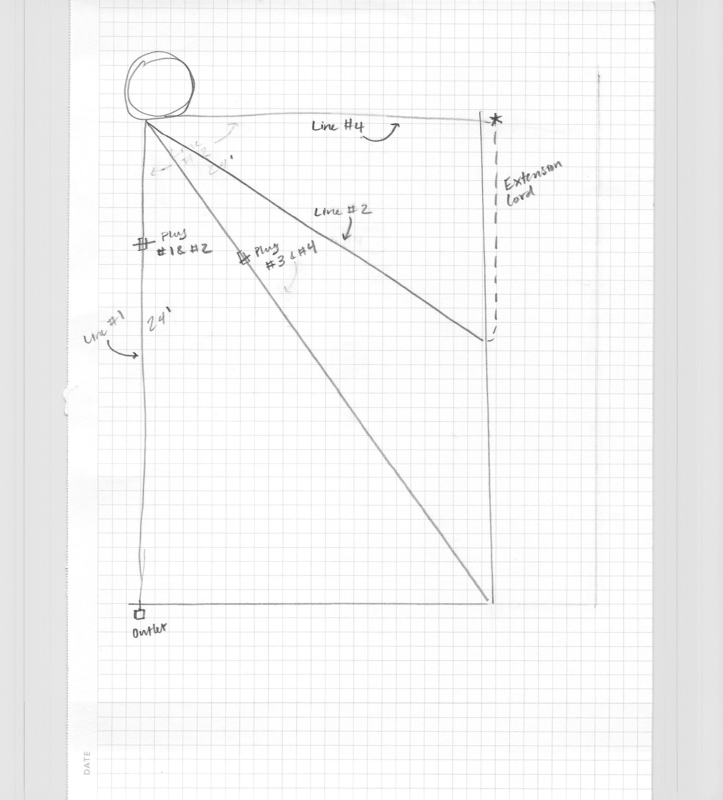 We took measurements and sketched out some options for how the lights could be laid out. While there are a number of ways we could have strung these lights over our backyard, we could only choose one. This post will just cover what we did. As you start your DIY, you may need to modify this plan to fit your unique circumstances. There’s a little work involved, but it’s not rocket science. You can do it! ^^^ Clearly, my artistic talents are not quite up to Ashley’s level! ***UPDATE 12/12/18*** The above materials are perfect for this project, but I just noticed that Amazon sells these String Light Hanging Kits. I have looked into it and they are legitimate. They could save you a lot of time and work! – I used 4 sets of 24-foot canopy/string lights – I bought them on Amazon. The sets are $39.97 which I found to be the best value out there. A few of my bulbs went bad, but they have a lifetime warranty and Alpan’s customer service was very quick to send me replacements. I haven’t had another issue. We chose LED lights because they don’t put out a lot of heat, and they use significantly less power. The bulbs also last longer so you don’t have to worry about replacing them every few months. LED anything is more expensive than traditional incandescent lighting, so we spent some time looking for affordable options. So far they’ve worked wonderfully, and we feel great about not running up the electricity bill. For our project, we had to do a little bit of electrical work to install a power outlet under my soffit and a switch inside my garage. The switch was really for convenience and is not required to have canopy lights. As for the wall outlet, our home is surprisingly lacking in outdoor power receptacles, so that was one challenge we were forced to overcome to make our string light dream a reality. All of that said, we’re not certified electricians and will not be advising or showing the electrical part of our project. 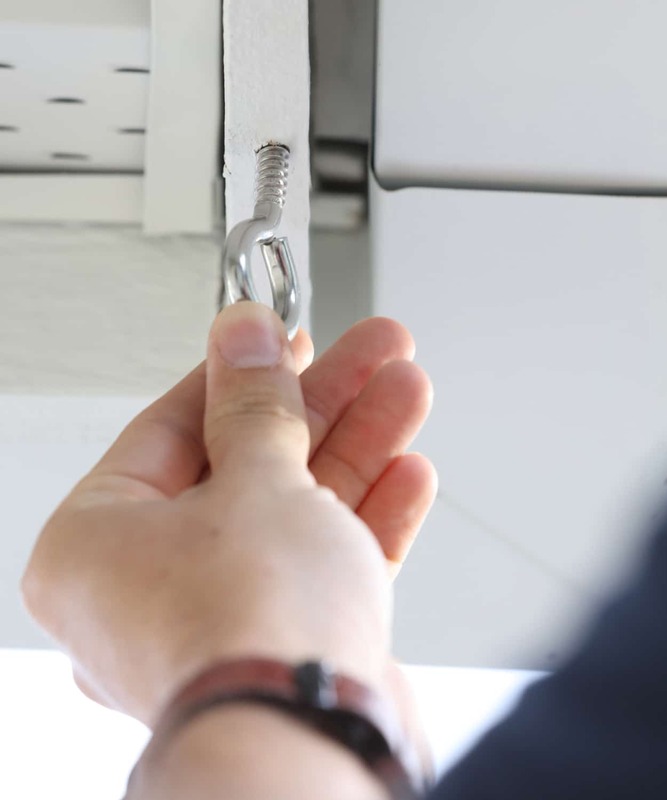 Consult a professional electrician if you feel your situation requires any electrical work. Since we were connecting lights from our house to a central location at our lone backyard tree, that was my starting point (not pictured). We measured about 11.5 feet high so the lights would slope up from the house to the tree. Next up, attaching the eyelets to the fascia on the house. Since we were running four lines from the house to the tree, we repeated this step four times. 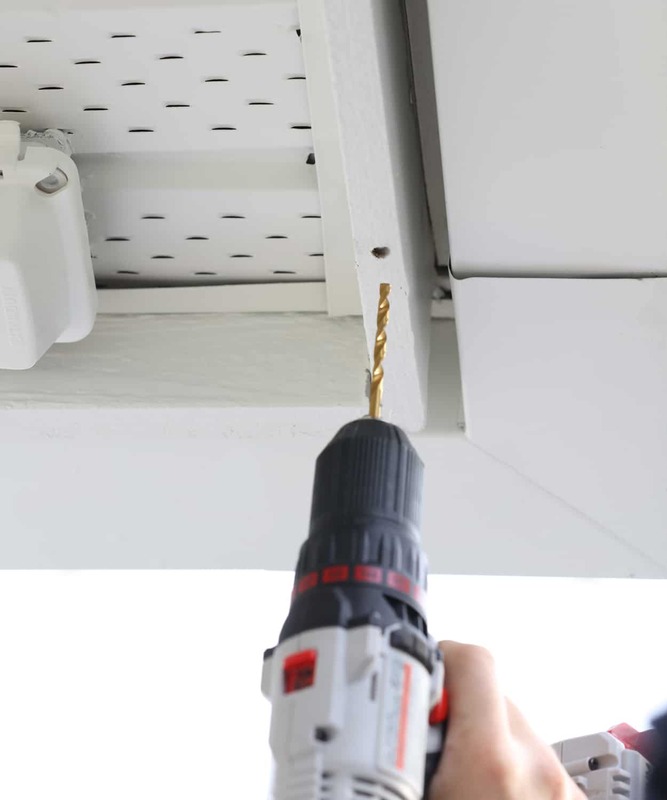 If you have a setup where you can drill into your house or a stud behind the wall, that’s an even better way to go. We’ll likely go back and reinforce these connections in the near future. Here we used the power drill and easily screwed in the 2 5/8” Screw Eyelet from National Hardware. 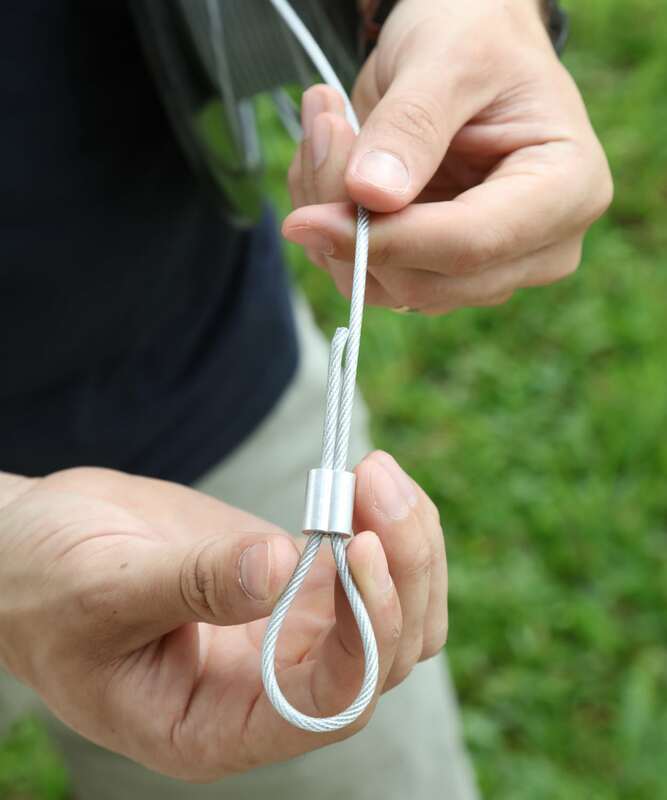 The steel cable is not mandatory for some people, but it absolutely was for us. The biggest benefit is the cable will keep the string light cord from stretching out over time, prolonging the life of the lights. 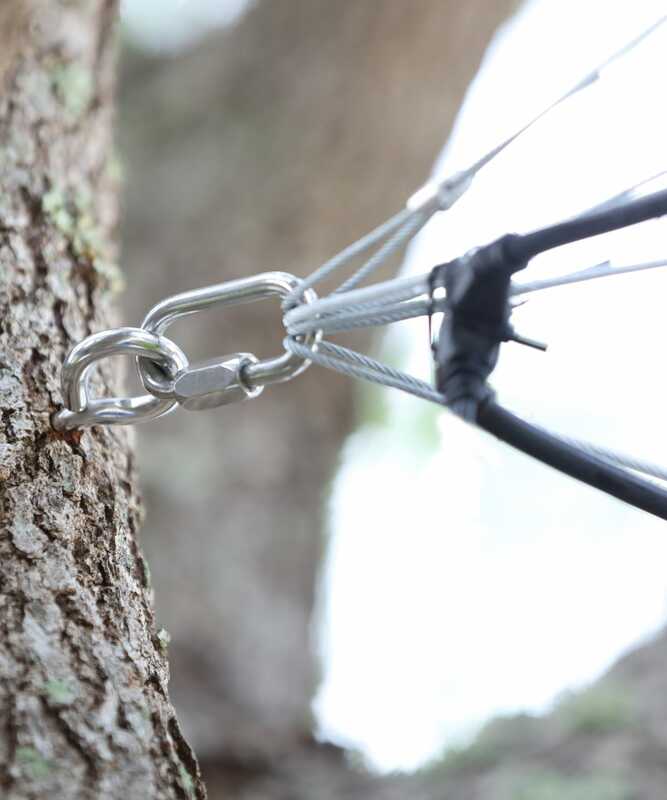 We ran four separate cable segments – each from the house to the tree. 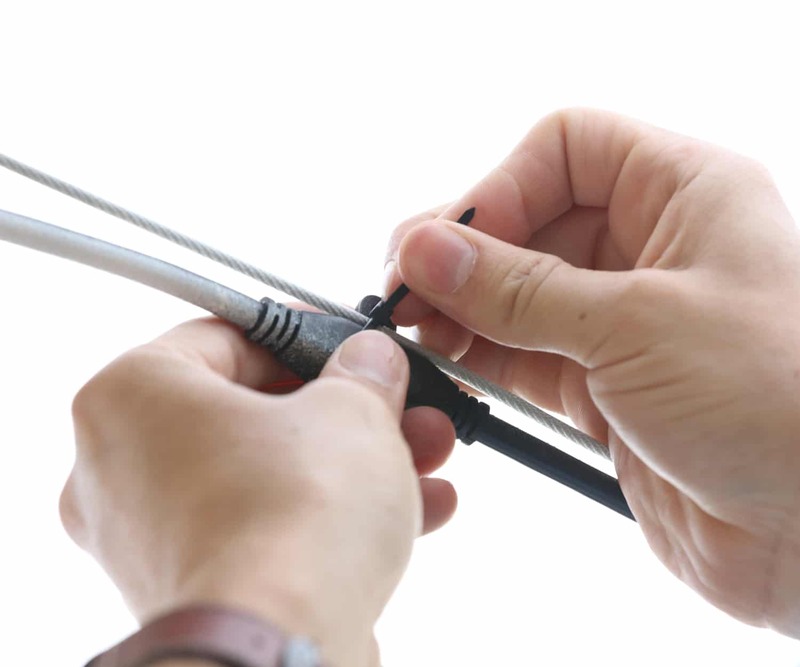 -Loop the cable and feed it through the ferrule. We used metal snips to both cut the cable and crimp the ferrules. 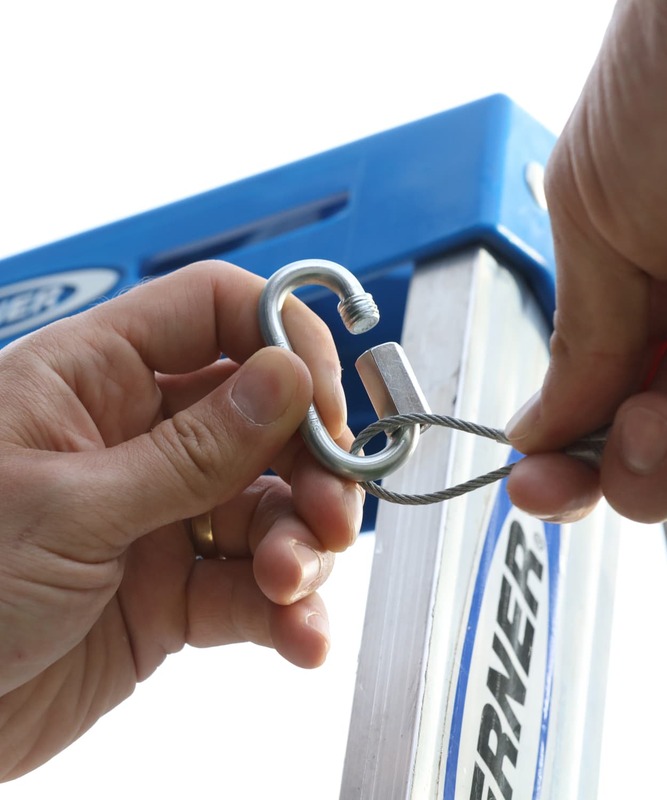 Bolt cutters work well for this too. 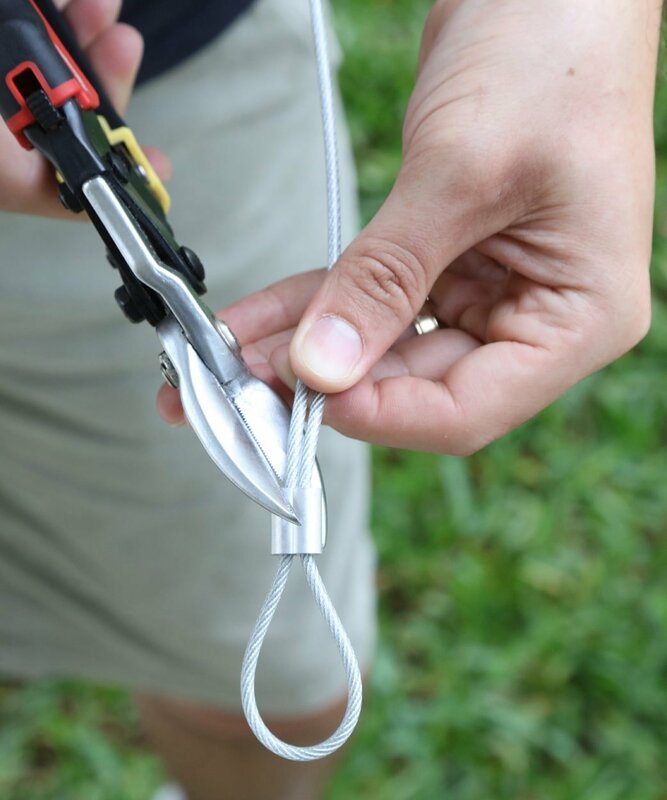 A crimping tool is the official tool for crimping ferrules, but because of the light load on the cable, we felt more than comfortable using the snips. 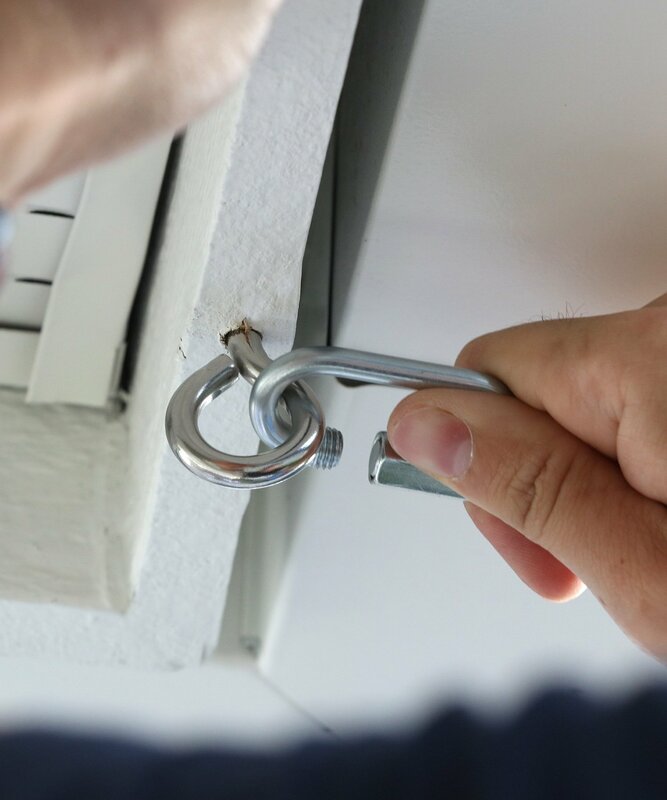 Connect the Quick Link to the eyelet. Do this on both ends of the line. Here you want to make sure the line has a little give but not too much. 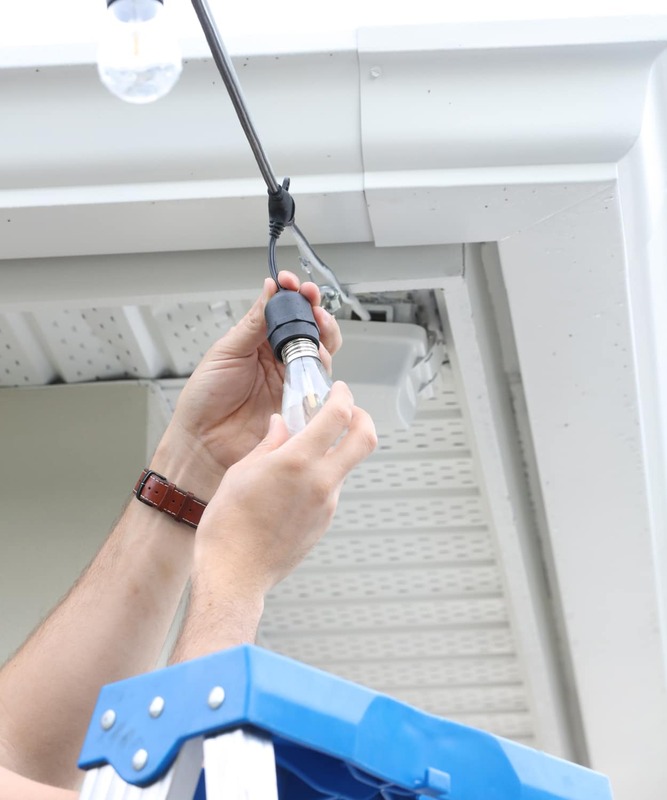 You don’t want the lights drooping and swinging too wildly in storms or windy weather. We used quick links for an easy takedown. We live in Central Florida where every few years we have an active hurricane season. I wanted to be able to take these lights down, if needed, at a moment’s notice. Using these quick links is one of a few ways to accomplish that, but it’s one of the easiest options. We got these from National Hardware, and you can also find them at Lowe’s. Phew! The cable portion is probably the most labor intensive, but with that all done you’re 80% there! 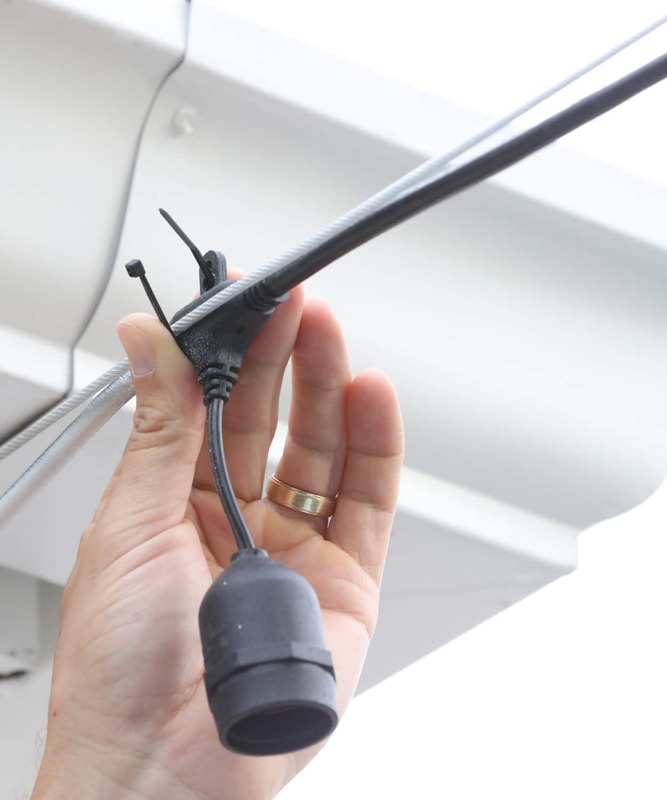 We placed two zip ties on the first and last lights on each strand for added security. One zip tie was fine for all the rest. 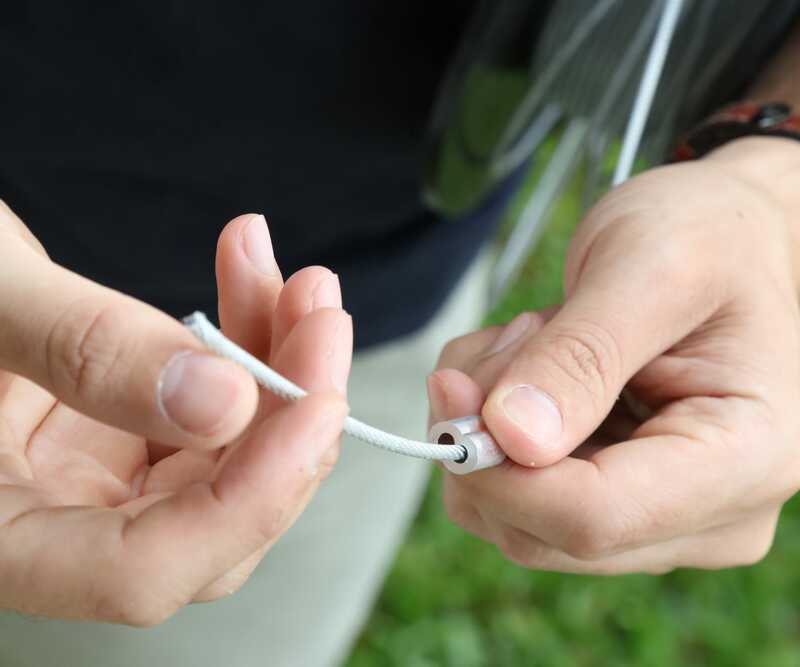 As you do this, carry scissors along with you and cut off the hanging end of each zip tie. That will make them as visually unobtrusive as possible. This is pretty self-explanatory, and when you’re finished, take a deep breath. You are DONE! Hopefully, wherever you are the sun will be setting soon. Pour yourself some wine, plug in your string lights, sit back, and enjoy the scene for all it’s worth. If you do attempt this or something similar in your backyard, we’d love to hear about it! If you have any questions, feel free to put them in the comments section and I’ll make sure to answer them as best that I can. Lastly, many of you have asked about the accent corner braces we put on the planter. They came from our partners at National Hardware as well. We built the planter, and we thought it was great but still lacking something. National Hardware has a huge selection of hardware that can bring any part of your home to the next level. We found these braces which not only strengthen the box, but they are decorative as well. Sometimes it’s the simplest details that make the greatest difference, and we could not be more pleased! P.S. 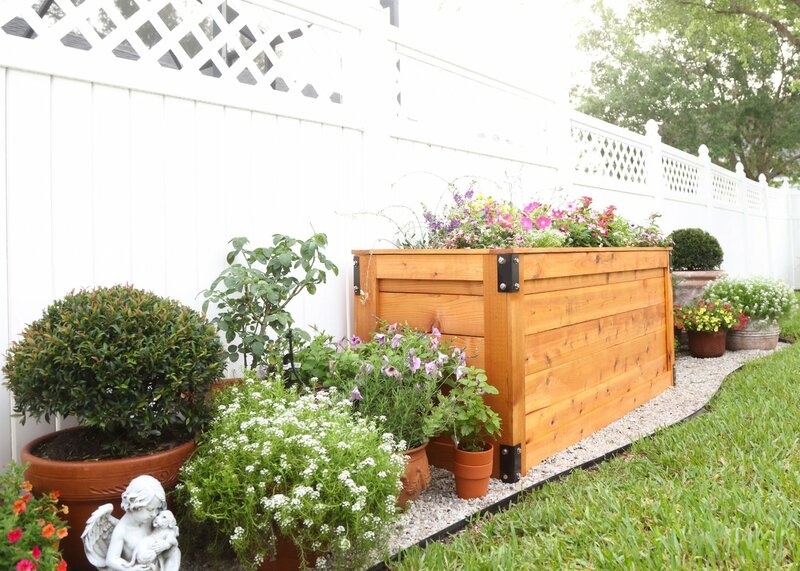 There will be a DIY post about building the planter AND what’s inside, so stay tuned! 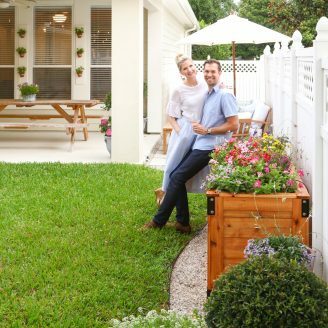 Don’t miss the full Backyard DIY Series! 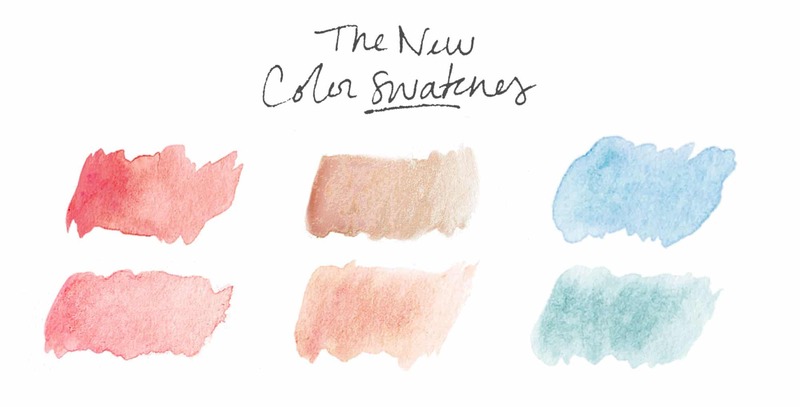 Next Post Easy Summer Beauty! Where did you get your lights? Hi Vanessa! Lights are here from Amazon. They were the cheapest I found in terms of LED lighting. They’ve been great so far! So gorgeous! Where are those larger weathered looking pots from at the far end of your garden? They are exactly what I’m looking for! Thank you! They are from Old Time Pottery! Great site. I have an outdoor plug but the lights aren’t long enough. How do I plug them in? Thanks Karen! 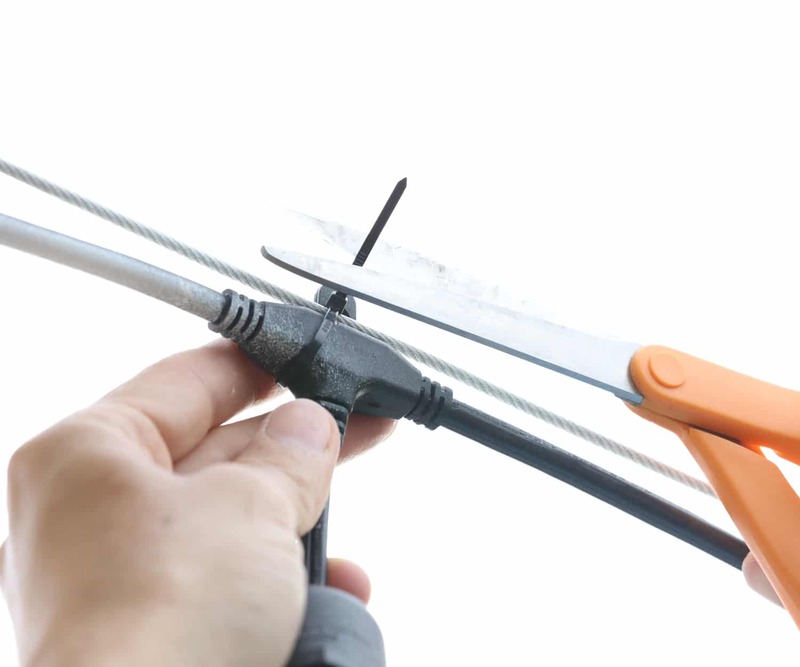 Do you have an outdoor extension cord that can reach it? That might be your best bet. 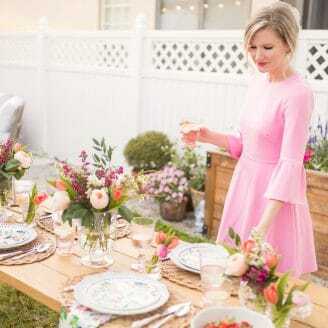 We have a similar set up in our backyard and are thinking of adding the pavers to the side to include a outdoor dining table. In that space, we currently have dead grass and some water runoff from our neighbors that puddles on our property. I’m thinking with the stone and pavers it could help with the puddling. Thoughts? 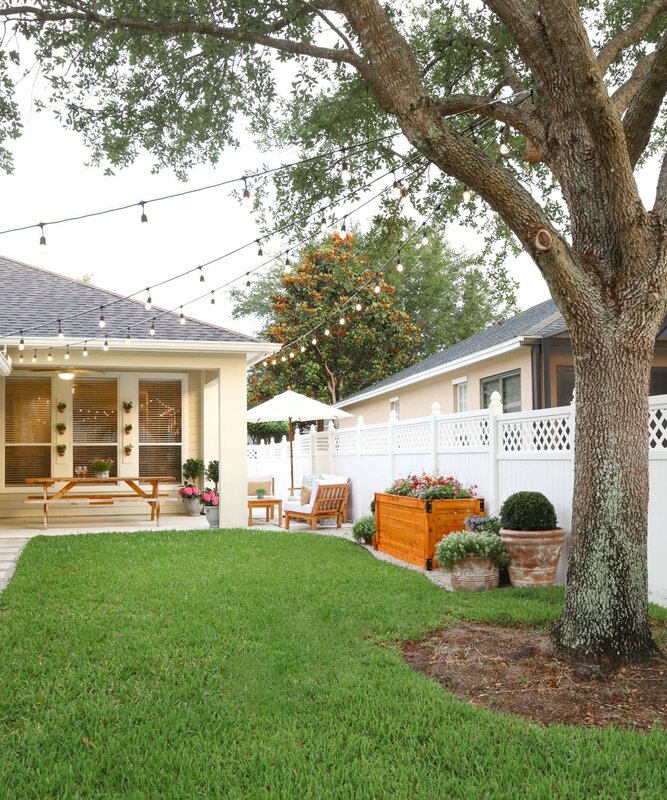 Also, with us having a similar backyard, I am thinking about also adding the string lights. I’ve always loved the look, but never believed I could have them. How does your lights get power? Obviously they are plugged in, but what does that look like with the wire hanging down to the outlet? Just trying to get an idea. Thank you for all of this beautiful inspiration! My husband will be THRILLED with our upcoming outdoor projects!! Hi Maegan, Thanks for reading and for the awesome questions! 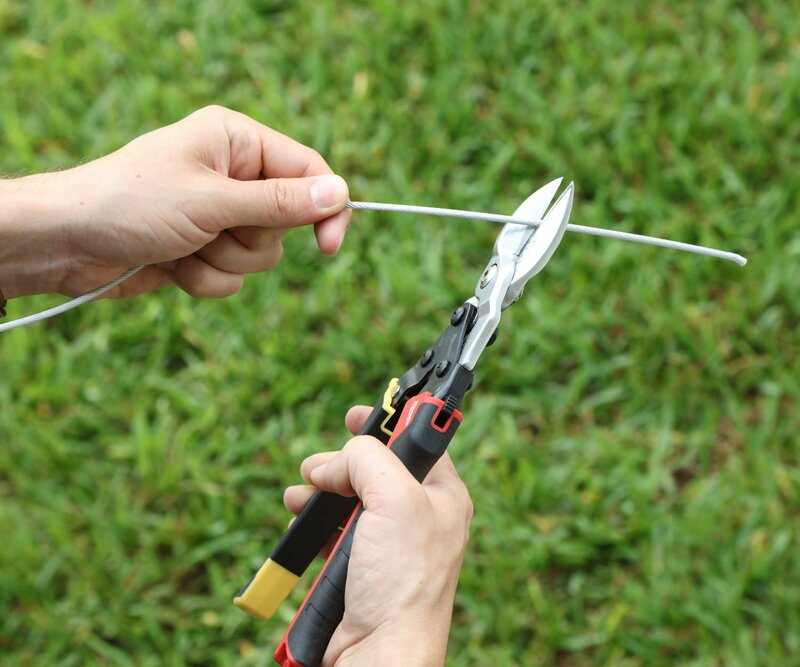 I’m excited to hear you guys are going to try this in your yard and can’t wait to hear how it goes. With regard to the water runoff, I’m not an expert on surface water drainage so I’ll be a little cautionary. The rocks are good for water sinking through, however, if that area sees a large amount and often there’s a good chance it will continue puddling. It may be a good opportunity to adjust the slope of that area so water flows down, perhaps away from your home to a midpoint between your properties. Just be sure your neighbor is cool with that and also try to find out how the builder initially graded the land to cope with surface water. I hope that’s at least a little helpful! Let me know if other questions come to mind! Nice looking string lights. I understand that you added an electrical box in the soffit–great idea, but with the hand-drawn layout shown how did you get all the light strings to the power source. That can be a big challenge for many layouts. Will, thanks and that’s a great question! You can see the box I installed into the soffit, but you’re right, I don’t show how I connected it all so that I am only using one power source. This may be tough to explain so I’ll work on a visual aid, but for now, imagine 4 light lines running from the tree to the house, from left to right (if you’re facing the tree), 1 – 2 – 3 – 4. Each line connects to a different point on the house going from left to right. The way I powered them is like this: lines 1 and 3 are part of the same strand (two 12-light strands). The “house” end of line 1 plugs into the outlet, the line goes to the tree and comes back to the house as line 3, where, at the end of it, I connected an outdoor extension cord and ran it under my the house fascia to the connection of line 4. Line 4 goes to the tree and comes back as line 2 and connects at the house. I feel ridiculous typing that out, but that’s how it’s done. Again, I’ll work on a diagram ; ) Let me know if that’s helpful at all! Great work! 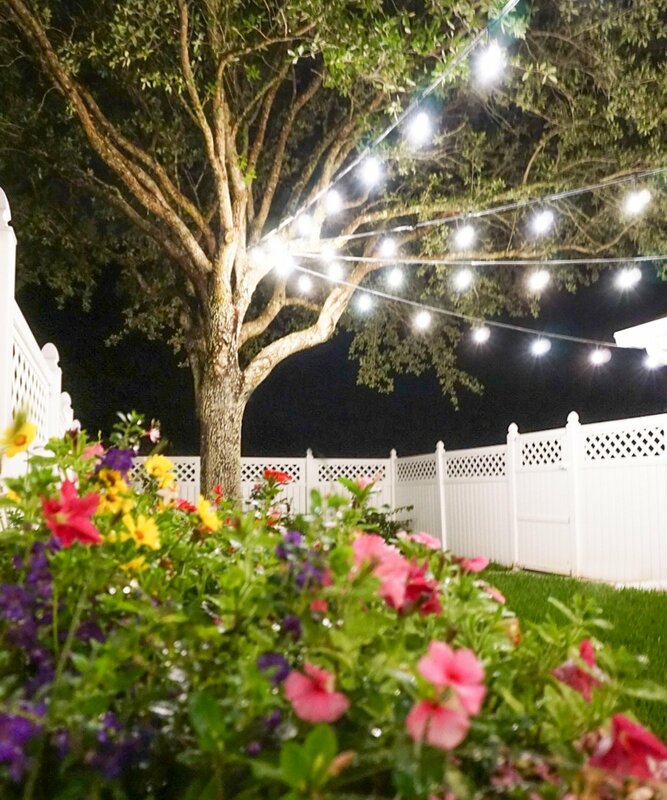 I am impressed with your work and got some great ideas to hang string lights in the backyard. Thanks for sharing the wonderful article. Thanks Amanda! Definitely let us know how yours turn out! Amanda! Thank you for taking the time to leave such a sweet note! 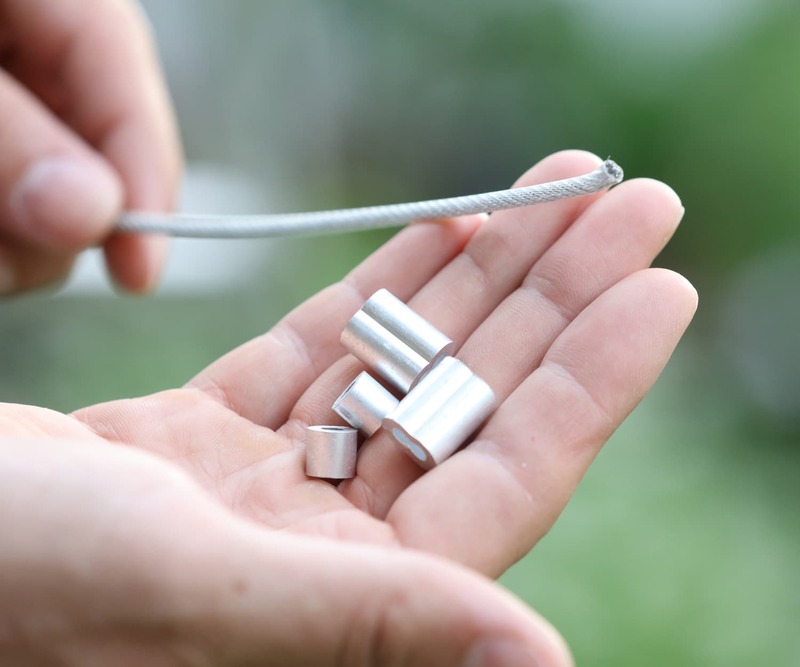 What gauge wire did you use? Was it vinyl coated? And would you use the same one or a different gauge next time? Thanks for the question! I used 3/32 vinyl coated wire rope. I would use it again, absolutely. I have the exact same setup, with the exact same lights. 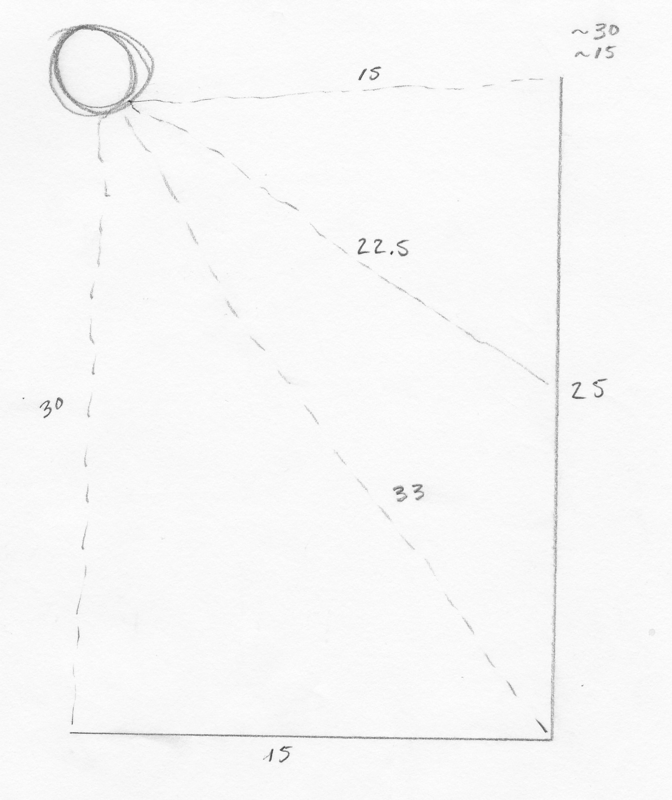 I’m confused how to get the 24′ of lights to fit in a 30′ length from the tree to the house. I know that may sound silly. Then, I also have a 17′ section from tree to house. What do I do with the excess lights? I’m reading this project and wondering the same thing! Hoping for some pointers. Thanks!! Hi Alyssum! Great question and my reply to the previous commenter will hopefully answer it. I included a sketch of how I connected the lights. If you have any further questions, definitely let me know! I had to get creative to do this, but for that 30′ run, I had to start my second strand of lights part way through and just connected them. Here is a drawing of what I did. Lines #1 and #4 are the outside lines. Lines #3 and #2 are the inside lines. The power came from an outlet connected to a light switch in my garage. The power runs from #1 to #4, an extension cord then carries the power from the end of #4 to #2, and from #2 to #3. I realize reading this back to myself, it sounds crazy, so I hope this picture is helpful in conveying the point. 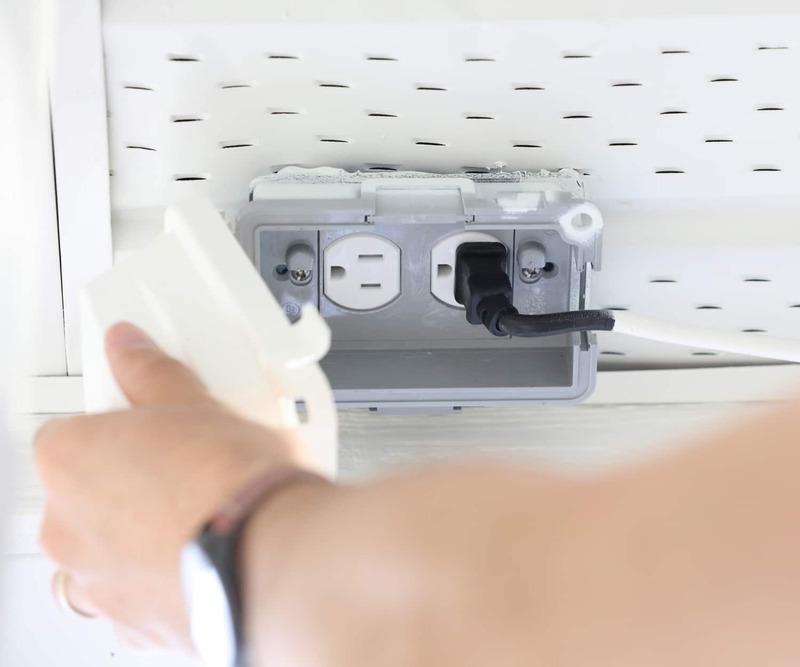 In an ideal world the light switch in my garage would connect to multiple outlets under my roof soffit and I wouldn’t need the extension cord. But I was learning as I did all this and this is the way I set it up. It has worked flawlessly. If you use an extension cord outside for any reason, make sure it’s covered and use an outdoor rated one. Let me know how it goes and if you have any further questions! Your instructions were spot on! Thanks so much! 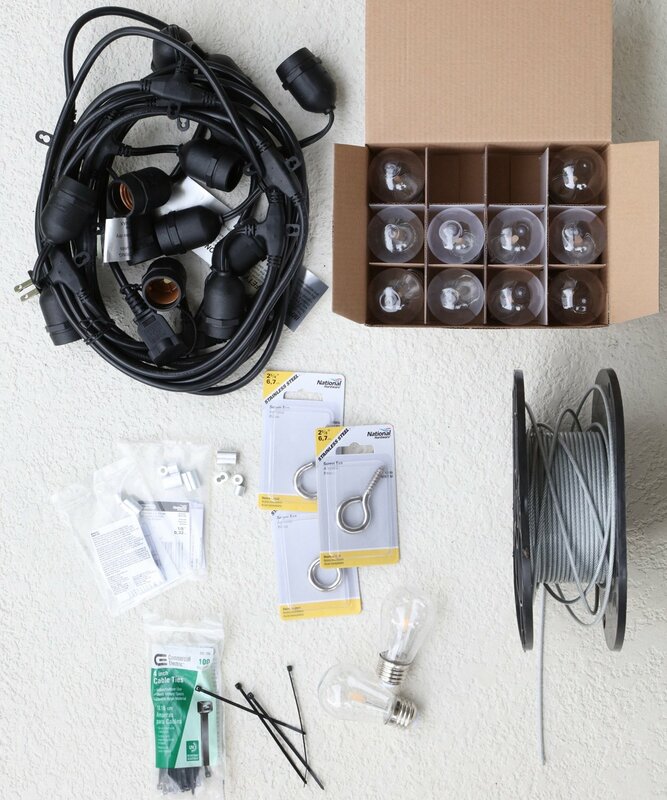 We ordered our lights at Amazon and picked the add’l supplies up at HomeDepot. Broke a few bulbs and ended up using a hammer to “crimp” the thingy on the cable. Thank you for sharing the details from your project! Mary – thank you for sharing how your project turned out. I love how you improvised and used a hammer to crimp the ferrule – I can completely relate to that! 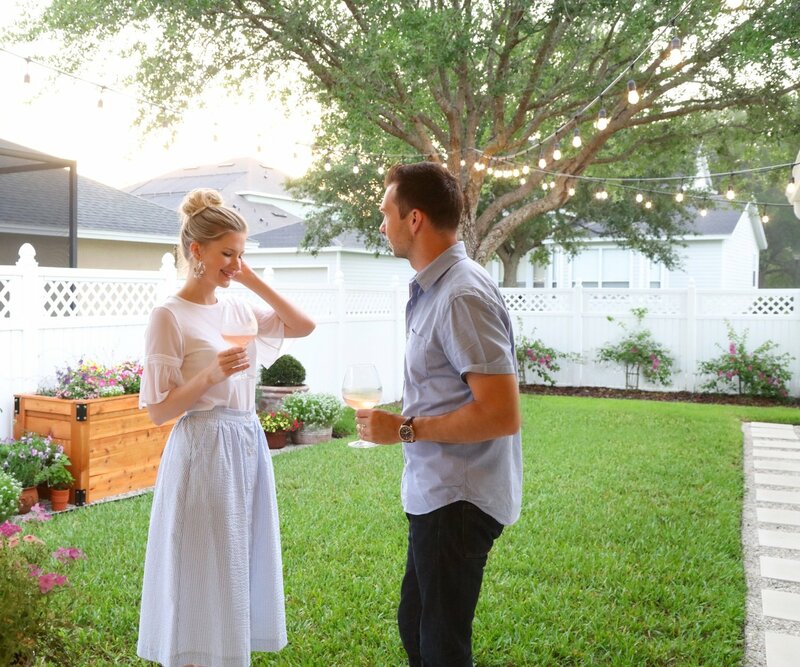 Cheers to enjoying your new space this Fall!